After I read about the factory in Meliana, I had to go there of course, to see what is left of it. There is a metro station "Meliana" and from the train I could already see the "castle". The factory was built in 1860 and began to work from 1864/65. 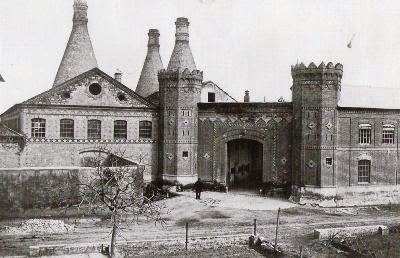 In this old photo you can see the bottle-shaped kilns. The factory walls still stand today, the belong to Schneider Electrics, who did not let me get onto their premises. So I walked all around it, until I came to the "palauet Nolla", the palace-showroom, where Miguel Nolla received his most important clients. The building is now in ruins and - of course - fenced off. On the façade you can see the portrait of the founder, the picture that was also used as title of the exhibition (see post before). In the museum they also depicted the floor plan with its different mosaics. Only one window was not completely closed and I could get a glimpse of the floor. As you might see it was the room on the bottom right of the plan. Miguel Nolla Bruget was born 22.5. 1815 in Reus, in a family of textile merchants. In 1835 he moved to Valencia and in 1839 he married Juana Sagrera Guix, a girl of high-class bourgeoisie. At first he worked in the textile industry and even had weaving looms until 1866, even in the already existing tile factory in Meliana. Together with his father-in-law and two other merchants, he also owned "La Industrial Valenciana", a company that produced glazed tiles and other construction ceramics, like bricks and roof tiles. The mosaic factory was established in Meliana, a locality north of Valencia, well comunicated by road and train and near the coast close to possible shipping harbours. Apart from the sale of his products via beautifully illustrated catalogues, he reconstructed a house next to the factory and converted it into a showroom, where he received his most important clients. In September 1871 even the king of Spain, Amadeo I de Saboya, came to visit and awarded the order "Gran Cruz de Isabella La Católica" in recognition for his work and business merits. it was not clearly stated, whether he ever went to England or had some connection with Minton Hollins, but he was clearly influenced strongly by them. The size of the mosaic pieces was based on the inch system with the basic size being 1,5 '', that is 3,81 cm. Even the size of the bricks he produced to build his factory, had english sizes and were shorter and thicker than the normal valencians. But in contrast to the tiles of Minton Hollins, Nolla tiles were pressed using dry, pulverized clay. 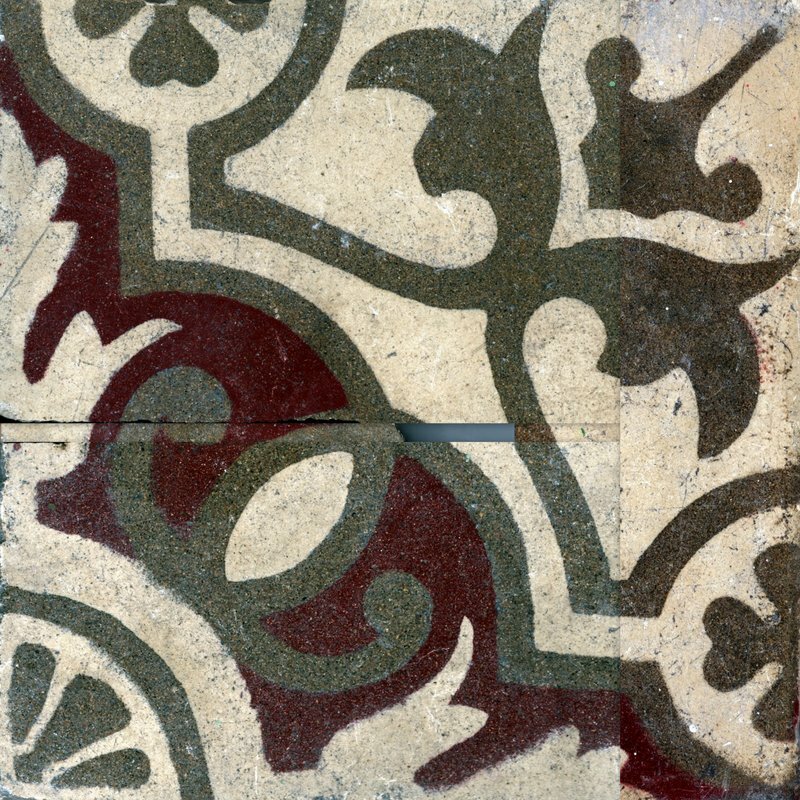 Encaustic tiles had to be pressed twice, first the design with a special stamp and then the whole tile with the other colour. The traditional colours used were: black, brown, dark grey, light grey, beige, orange, red, blue and white. After the death of Miguel Nolla, when the company was managed by his sons "Hijos de Nolla", the colour scheme was greatly amplified. Time for a new post - with a "new" tile! Half a year since I have written anything here? unbelievable! 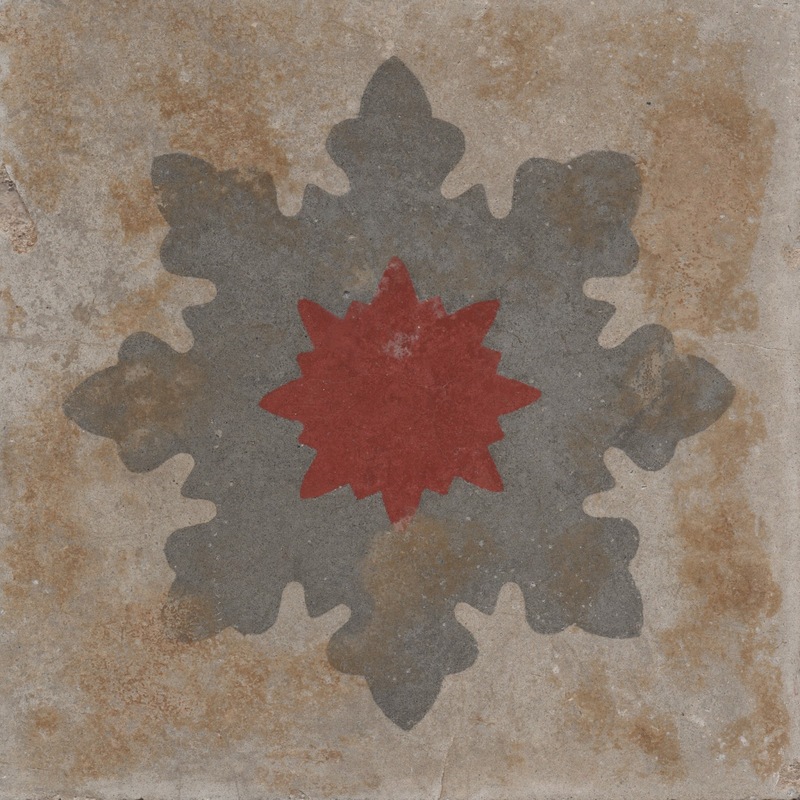 In the ruins of an old house I found a tile, which was very dirty, but on the back I could decipher …LONA. Ist es wirklich schon ein halbes Jahr her, dass ich hier etwas geschrieben habe? Unglaublich! In der Ruine eines alten Hauses fand ich eine sehr schmutzige Fliese, aber auf der Rückseite konnte ich …LONA entziffern. ¿Medio año que no he escrito algo por aquí? Increíble! Und der Firmenstempel auf der Rückseite stellte sich als ESCOFET TEJERA Y CA. BARCELONA heraus. 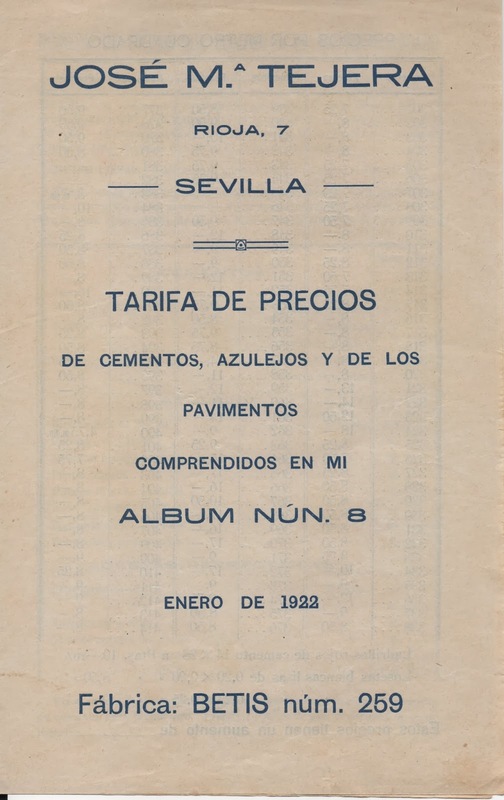 So the tile has been manufactured between 1896 and 1903 - and most likely in Sevilla! Das heißt, dass diese Fliese zwischen 1896 und 1903 hergestellt wurde und zwar wahrscheinlich in Sevilla! ¡Significa, que la baldosa fue fabricado entre 1896 y 1903 y muy probablemente en Sevilla! Unfortunately she didn't find a complete tile… so I tried to "repair" it digitally. I scanned the bigger parts and put them together. Leider hat sie keine ganze Fliese gefunden … also habe ich versucht, sie digital zu "reparieren". Ich habe die größeren Stücke eingescannt und dann zusammengesetzt. Lamentablemente no encontré una baldosa completa … entonces he probado a "repaprarla" digitalemente. He escaneado los trozos más grandes y los he juntado. It is not perfect, but you can see how beautiful this pattern was. More so as a whole floor! Es ist nicht perfekt, aber man kann erkennen, wie schön dieses Muster war, besonders, wenn man den ganzen Fußboden sieht! No está perfecto, pero se puede imaginar como bonito estaba este patrón. ¡Y más cuando se ve todo el suelo! Saturday in Fuengirola was the first time I saw old cement tiles for sale on the flea-market. Am Samstag in Fuengirola habe ich zum ersten mal Zementfliesen auf dem Flohmarkt angeboten gesehen. El sábado en Fuegirola fue la primera vez que visto baldosas hidráulicas a la venta en un rastrillo. 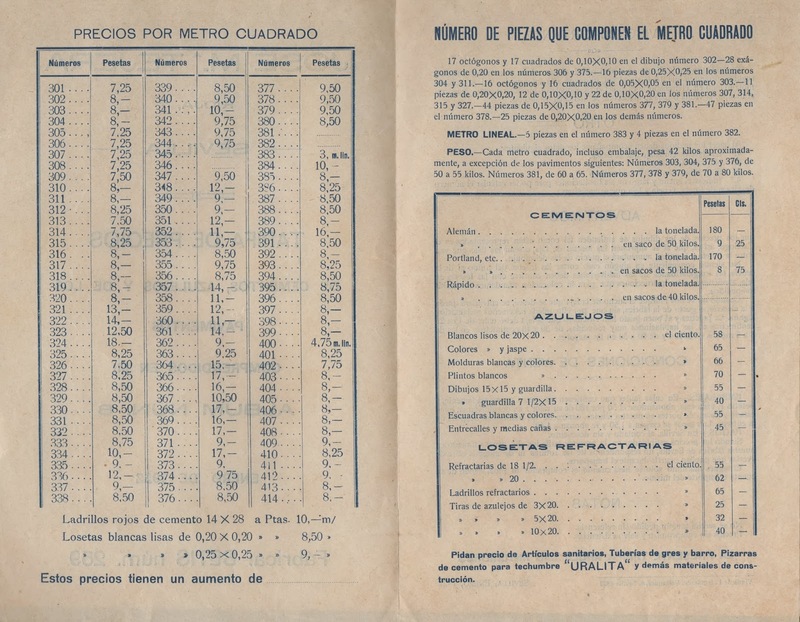 The seller said, there were all from Málaga capital, but didn't have a fabric´s stamp. Der Verkäufer sagte, sie seien alle aus der Stadt Málaga; leider hatten sie keine Fabrikmarke. El vendedor decía que son de Málaga capital; por desgracia no llevaban un sello de fábrica. A while ago I was invited to see a very special floor in Sevilla. 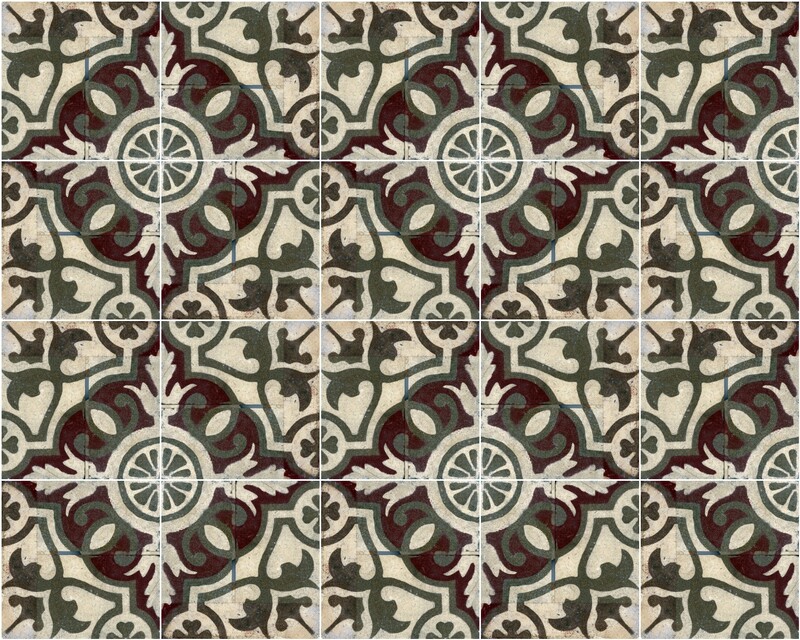 If you think (like I did): what can be so different, I think I have seen all sorts of tiles and patterns - YOU ARE WRONG! Vor einiger Zeit war ich eingeladen in Sevilla einen ganz besonderen Fußboden anzuschauen. Wenn ihr jetzt (genauso wie ich) denkt: Was kann schon so besonders sein, kennen wir nicht schon alle Arten von Fliesen und Mustern - FALSCH GEDACHT! Hace algún tiempo estuve invitado a ver un suelo excepcional en Sevilla. Si piensas ahora (como yo): Que puede estar tan espectacular de un suelo, no hemos visto todas posibles losetas y dibujos - ¡HABEÍS EQUIVOCADO! y muchas gracias a Cándido, que me lo enseñó! Is it really three months since I last wrote something here? Shame on me! And I can't blame anybody but myself, because a lot has happened that is worth telling. 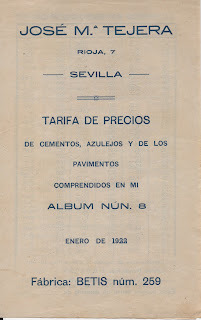 a pricelist from 1922 of the cement tiles of José María Tejera for his album no. 8. Ist es wirklich schon drei Monte her, dass ich hier etwas geschrieben habe? Schande über mich! Und ich kann auch niemand außer mich dafür anklagen, denn es ist wirklich viel Erzählenswertes passiert. eine Preisliste von 1922 der Zementfliesen von José María Tejera für sein Album Nr. 8. Ya son realmente tres meses desde he escrita algo aquí? ¡Que vergüenza me da! Y no puedo culpar a alguien otro que mi mismo, porque se ha pasado mucho para contar. 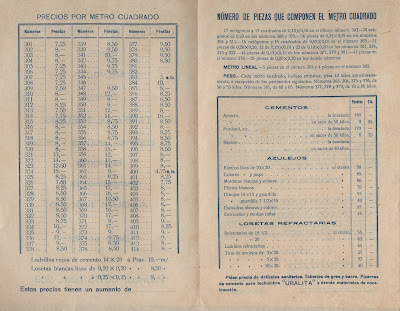 una lista de precios del año 1922 de los mosaicos hidráulicos de José María Tejera para su álbum no. 8.